Meet Natio - they make cosmetics, skincare products, and deliciously-scented things for your home. They're an Australian, family-owned company, and they're all about celebrating the world's natural beauty. Everything Natio make uses all-natural ingredients, including essential oils and plant extracts. Isn't luxurious fizz the stuff dreams are made of? 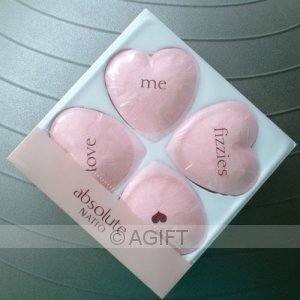 These four heart shaped fizzies are infused with a light fresh scent. Simply drop one in your bath, watch it quickly dissolve...then sit back and relax! fizzies in a Natio gift box.